Kaabil is an upcoming bollywood movie in 2017, It is Action Drama film and Hrithik Roshan Yami Gautam in lead roles. This film is Directed by Sanjay Gupta and Produced by Rakesh Roshan. It is made under the banner of FilmKraft Productions Pvt. Ltd. 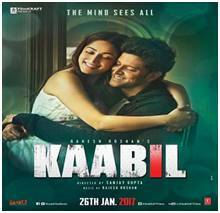 The film is set for release on January 25, 2017.First look Poster of Upcoming 2017 Bollywood Film "Kaabil"
The movie is produced by Rakesh Roshan under his production house under FilmKraft Productions Pvt. Ltd. Rajesh Roshan will be compose the music and Salim Sulaiman giving background music to the film and Resul Pookutty for the film's sound design. The cinematography will be done by Sudeep Chatterjee & Ayananka Bose.